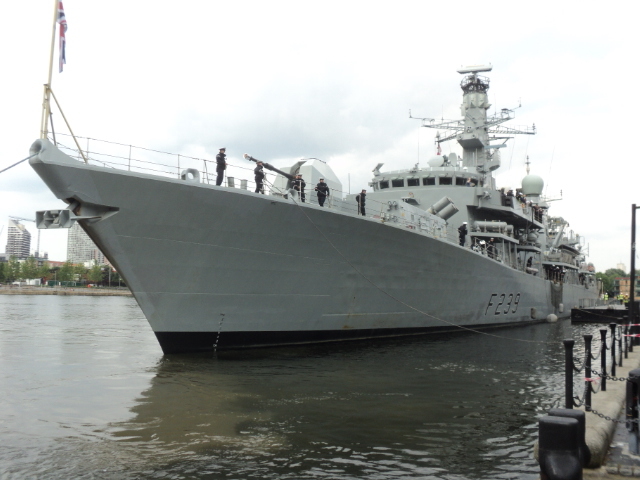 As part of Armed Forces Day, the HMS Richmond welcomed the general public on board. The Flags were out amongst the skyscrapers. 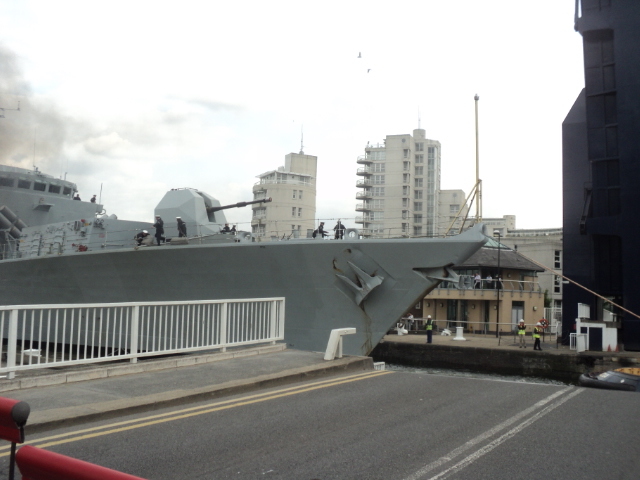 A new visitor in West India Dock is the HMS Richmond (F239), one of 13 Type 23 Duke Class frigates that form a major part of the naval fleet. 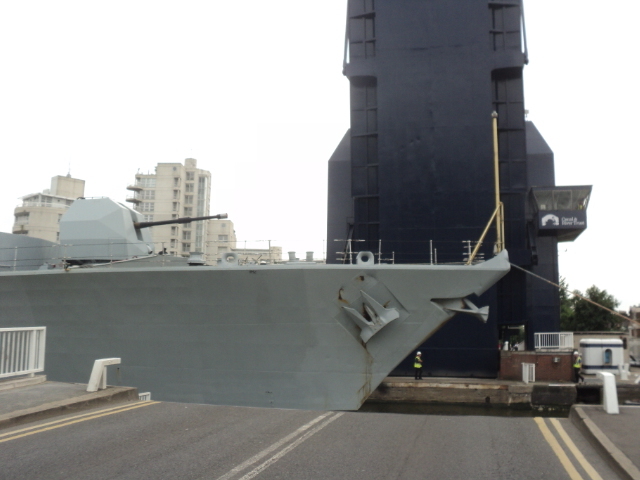 She holds the distinction of being one of the last warships to be built by Swan Hunter shipyard, she was launched in 1993. 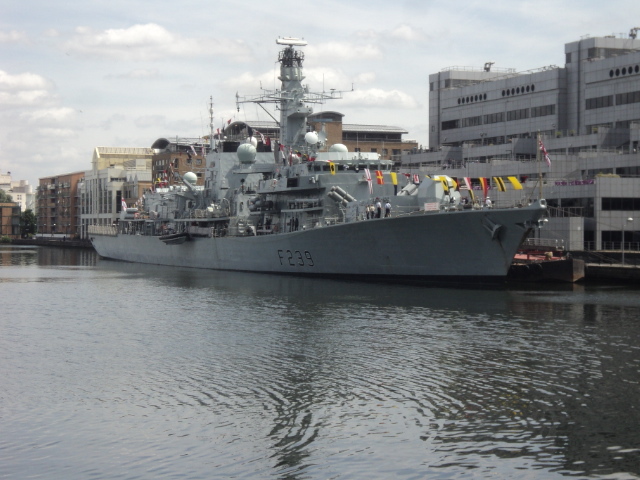 Since then she has been involved in many military and peace keeping campaigns most notably the Iraq war and helping with rescue efforts after Hurricane Frances and Ivan hit the Carribean in 2004. 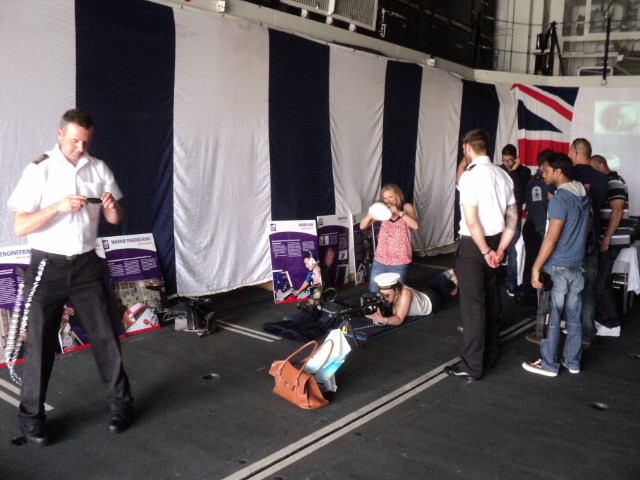 Whilst in London the crew will be involved in a number of functions. 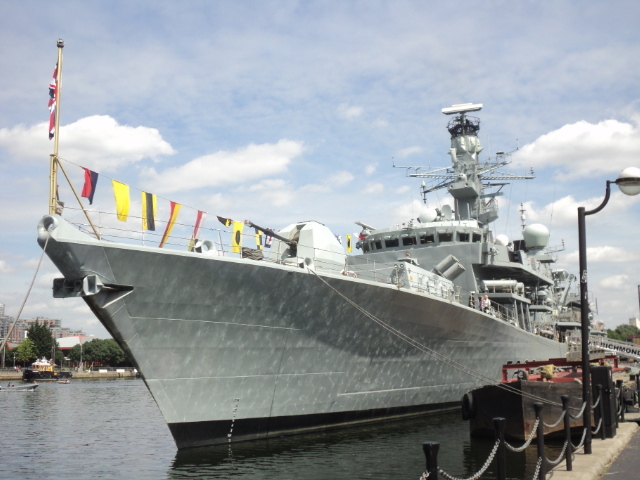 However the highlight of her stay happens on Saturday (June 29) – Armed Forces Day – when the warship will be open to visit by the general public. 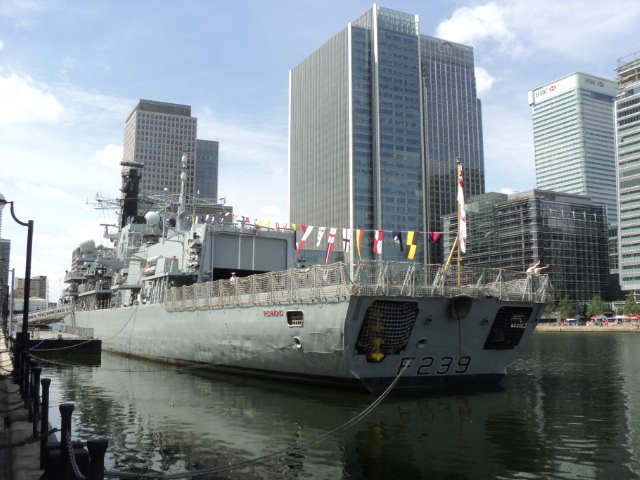 The ship will be open from 1pm until 3pm only and access is via Thames Quay at West India Dock. 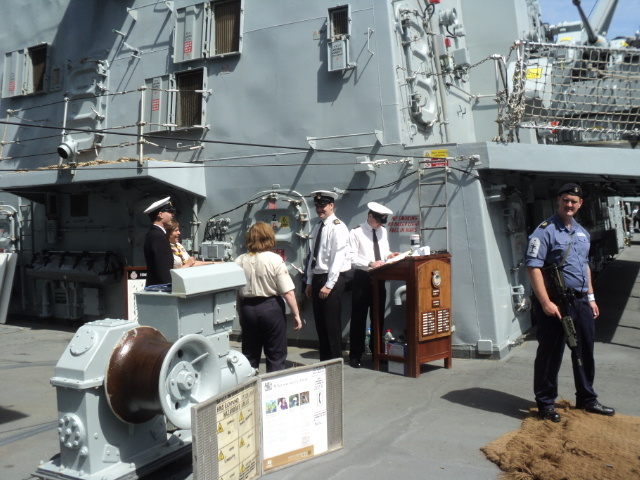 Please note access is not suitable for those with limited mobility as ship tours may require the use of gangways and ladders. 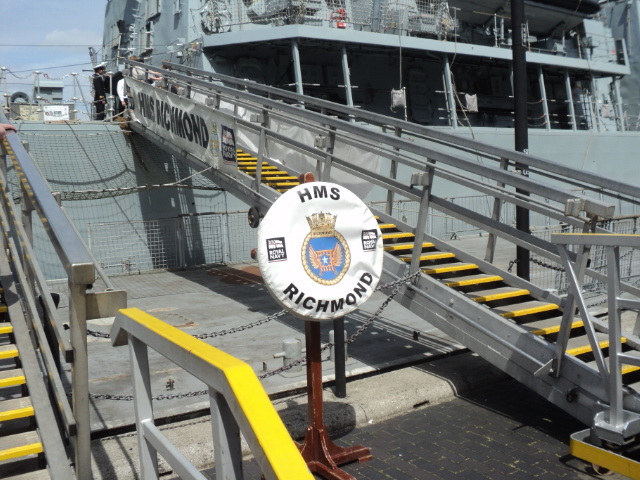 HMS Richmond is the seventh Royal Navy ship to proudly bear the name. These excerpts are taken from the Book Seven Years Hard written by the Reverend Free in 1904. 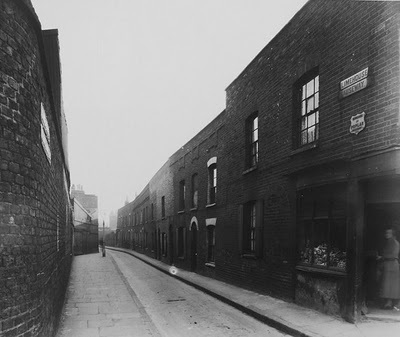 In a previous posts we read how the Reverend Free tired of tending to well off parishioners decided he wanted to undertake some missionary work in the Isle of Dogs, when he arrives in early 1897 his first impressions are not good and very soon after he gets a not particularly friendly welcome from some of the locals. After spending some years on the Isle of Dogs and getting to know the inhabitants the Reverend Free goes on to discuss their vices and virtues. Well, let us acknowledge at once that the life of the East-ender is more or less a closed book to us. As our experience of him increases, our understanding of him seems to decrease. The problem is larger than we anticipated ; more intimate realisation of it confounds us. The East-ender’s sorrows, his joys, his ambitions : what does the most experienced know of these, save in the most superficial way ? Keenly desirous as we are of entering into the inner meaning of the life of the toiler, the most sanguine can boast but very partial success. Brotherhood is as yet too new a word ; identity of interest has not yet become a reality. Nevertheless, the lights and shades of the picture stand out prominently. Like other people, East-enders have their virtues and their vices, their angelical moments as well as their diabolical. Certainly they are not altogether bad ; quite as certainly they are not altogether good. The besetting sin of the East-ender is intemperance. The drink habit is all but universal. If a dock labourer is invited to a ” beano,” he forthwith begins to devise the biggest possible ” booze ” at the highest possible price. Tell a factory girl that you are going to take her for an outing, and she immediately falls a-dreaming of unlimited “treats” of port wine. Boys on a holiday regard it as quite the correct thing to get drunk. And even women have very little notion ot a day in the country apart from the bottle. Nevertheless, women are not so very culpable. For one intoxicated woman, you will probably find two intoxicated boys and three intoxicated girls. Like most evil things in the East End, the trick of gambling is acquired early in life. Pitch-and-toss at the street corners is of the passionate kind. On a single Sunday afternoon a boy will lose as much as five or six shillings. It is difficult for the police to cope with the evil, even when they are anxious to do so, which is not always. For the lads have their scouts at every corner,and at the sotto voce cry of ” Copper!” dissolve as it were by magic. Moreover, there is always a friendly neighbour to give asylum to the young miscreants. Doors left hospitably open afford a convenient means of escape. So many streets and alleys are cul-de-sacs, that a flank movement is denied the most consummate generalship. And it really is difficult fora policeman with any dignity to insist, in the face of absolute denial from the innocent-looking tenant of a house, that his quarry is in hiding under the family bed. Foremost among the virtues of the East-ender is his good-humour. Good-humour is the redeeming point in his character, the salt that sweetens his very impurities, the lever that lifts him from the gutter where he is prone to lie all too complacently. He has many failings, many right-down vices ; but through them all,rendering them almost tolerable, runs that rich vein of gold. That is to say, he is fun-loving as well as amiable. His capacity for fun is enormous ; sometimes manifesting itself in sheer waggishness, at other times in the driest of dry banter, again in pungent and even delicate wit. Rarely is his smartness cruel. When it is so, it is jagged rather than keen. It does not cut ; it tears. His wit is easy and refreshingly original. Also, which is a great thing, it is without fear. Next to his humour I should say that the East-ender’s most striking virtue is his affectionate clannishness. He will do anything for his own. Is a woman sick ? There will be no lack of willing hands to help with the children and look after the husband. Is a neighbour ” badly off,” which in East End vernacular means starving ? Somebody’s pocket is always full enough to spare a copper or two. It is not unusual for a whole street to subscribe to a present in money for a decent man or woman unusually down on their luck ; and the ” friendly lead ” for a poor fellow who has met with an accident. 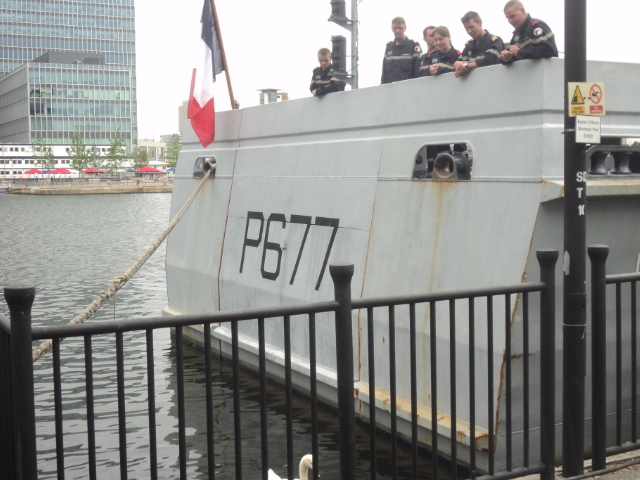 Last week saw a lot of excitement on the Greenwich foreshore opposite the Isle of Dogs with an appearance of a whale, however it turned out that it was only a fibre glass model and was part of the Greenwich and Island festival. 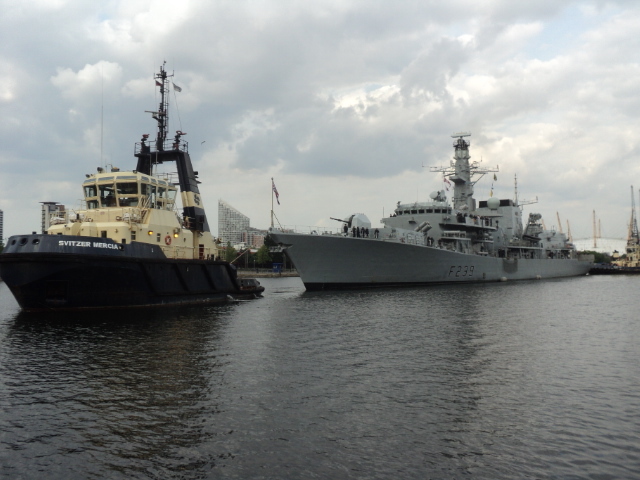 It did however highlight one of the strangest aspects of London life is that very occasionally whales do make their way up the Thames often getting beached in Greenwich and the Isle of Dogs causing considerable interest to the local population but usually ending in the poor creatures demise. One of the earliest eye-witness accounts is by the diarist John Evelyn in 1658. 3rd June, 1658. 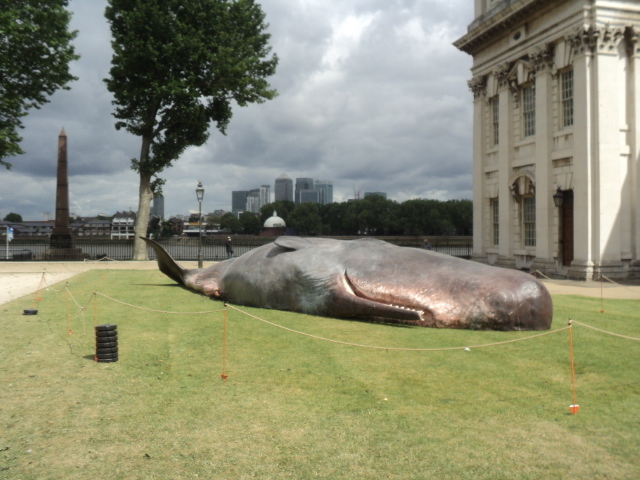 A large whale was taken between my land abutting on the Thames and Greenwich, which drew an infinite concourse to see it, by water, horse, coach, and on foot, from London, and all parts. It appeared first below Greenwich at low water, for at high water it would have destroyed all the boats, but lying now in shallow water encompassed with boats, after a long conflict, it was killed with a harping iron, struck in the head, out of which spouted blood and water by two tunnels; and after a horrid groan, it ran quite on shore, and died. Its length was fifty-eight feet, height sixteen; black skinned, like coach leather; very small eyes, great tail, only two small fins, a peaked snout and a mouth so wide, that divers men might have stood upright in it; no teeth, but sucked the slime only as through a grate of that bone which we call whalebone; the throat yet so narrow, as would not have admitted the least of fishes. The extremes of the cetaceous bones hang downward from the upper jaw, and are hairy toward the ends and bottom within side: all of it prodigious; but in nothing more wonderful than that an animal of so great a bulk should be nourished only by slime through those grates. 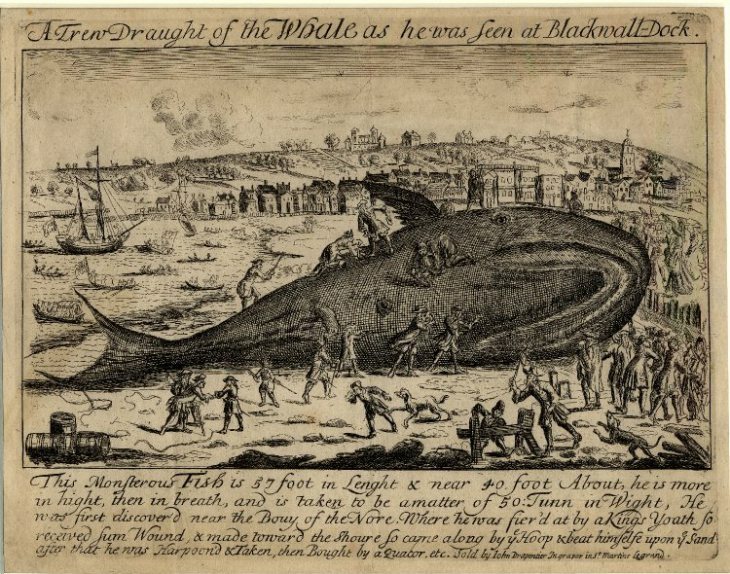 In 1690 an etching was made of a beached whale at Blackwall Dock. Unlike our more enlightened times, the first inclination was to kill these visitors as quickly as possible being viewed as ‘monstrous fish’. A more scientific approach was recorded by Francis Buckland in the 19th Century in his Curiosities of Natural History. However this approach nearly had tragic consequences for a certain Mr Clift, the assistant to Mr Hunter of the Hunterian Museum. 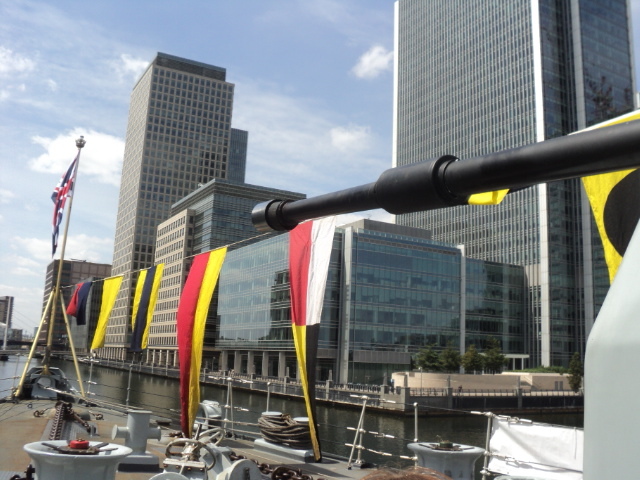 Some years before I was born, a large whale was caught at the Nore, and towed up to London Bridge,the Lord Mayor having claimed it When it had been at London Bridge some little time, the Government sent a notice to say the whale belonged to them. 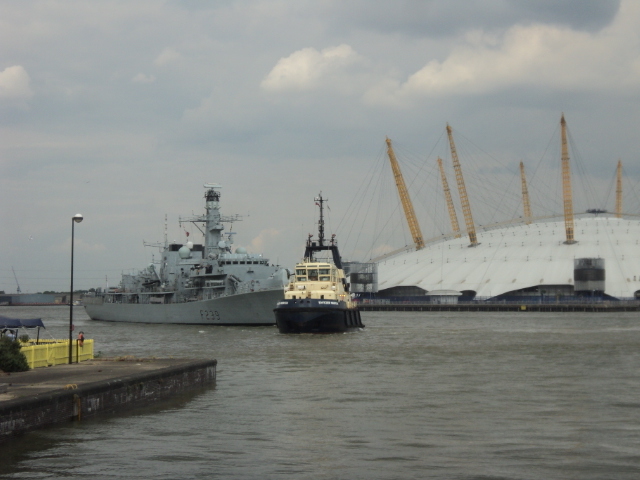 Upon which the Lord Mayor sent answer, ” Well, if the ‘whale belongs to you, I order you to remove it immediately from London Bridge.” The whale was therefore towed down stream again to the Isle of Dogs, below Greenwich. The late Mr. Clift, the energetic and talented assistant of his great master, John Hunter, went down to see it He found it on the shore, with its huge mouth propped open with poles. In his eagerness to examine the internal parts of the mouth, Mr. Clift stepped inside the mouth, between the lower jaws, where the tongue is situated. This tongue is a huge spongy mass, and being at that time exceedingly soft* from exposure to air, gave way like a bog, at the same time he slipped forwards towards the whale’s gullet* nearly as far as he could go. Poor Mr. Clift was in a really dangerous predicament ; he sank lower and lower into the substance of the tongue and gullet, till he nearly disappeared altogether. He was short in stature, and in a few seconds would, doubtless, have lost his life in the horrible oily mass, had not assistance been quickly afforded him. 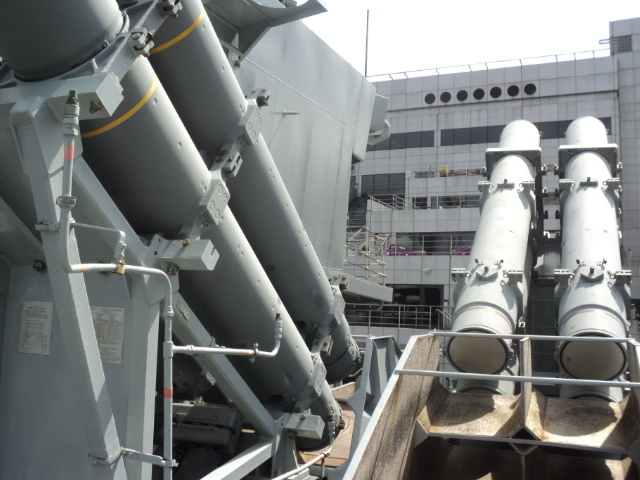 It was with great difficulty that a boat hook was put in requisition, and the good little man hauled out of the whale’s tongue. In 1895 a whale 21 ft. in length made its way up the Thames to London, and, becoming injured by a steamer, was stranded on the Recreation Ground on the Isle of Dogs. 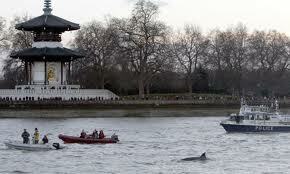 In living memory the most famous case was the whale in 2006 that got stranded near Battersea and the Houses of Parliament. 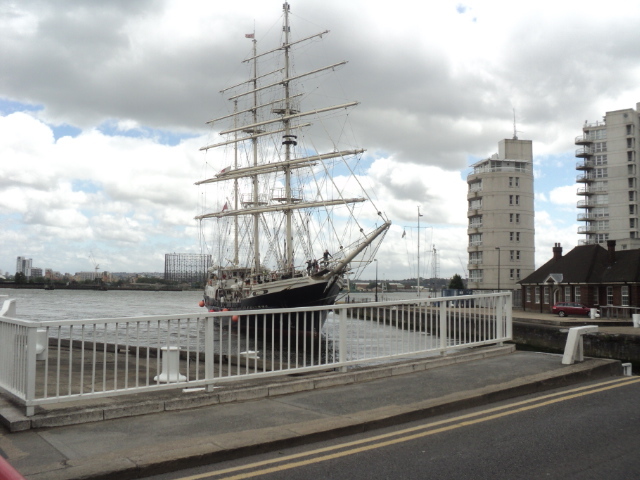 Today saw the arrival of the STS Tenacious, a wooden sail training ship which was specially designed to be able to accommodate disabled sailors. 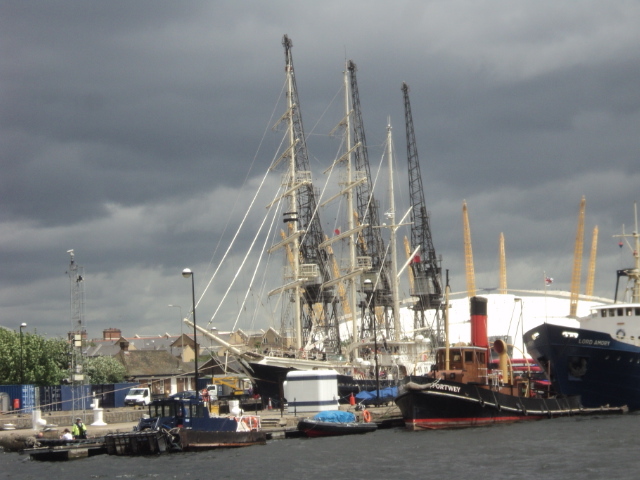 Launched in Southampton in the year 2000, it is one of the largest wooden tall ships in the world. 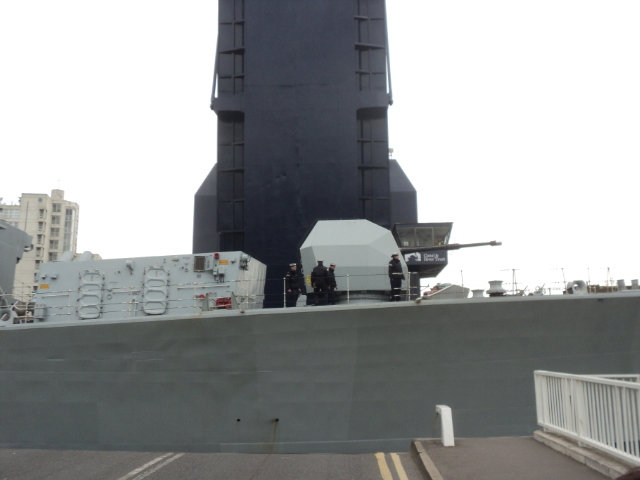 It is 65 metres long with a beam of 10.6 metres at its widest point. 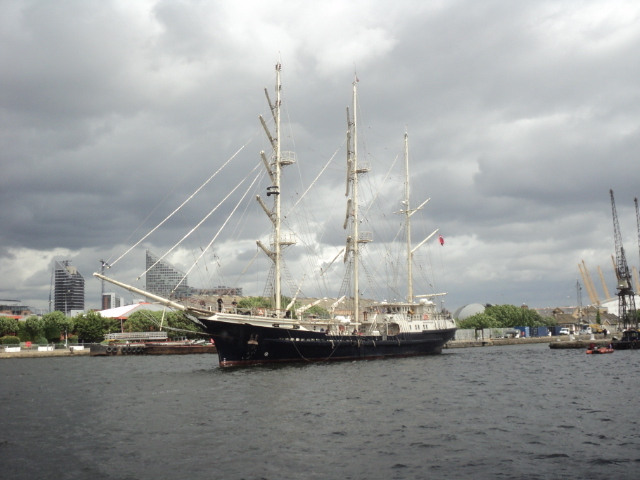 The Tenacious and its sister ship the Lord Nelson are regular visitors to West India Dock. They are owned by the UK-based charity the Jubilee Sailing Trust who have for many years have pioneered sailing for the disabled. 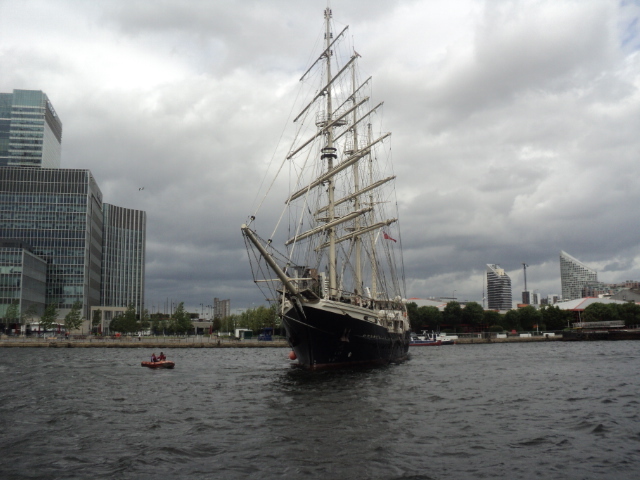 The Jubilee Sailing Trust became a registered charity in 1978 and was the brainchild of Christopher Rudd, a school teacher and sailor who wanted to give the disabled children he taught the same experiences his able-bodied students had. 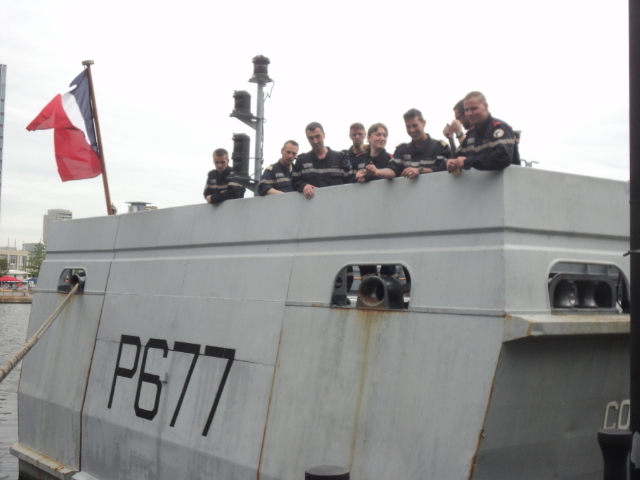 Since its launch Tenacious has taken nearly 12,000 people sailing of these 3,000 were physically disabled and 1,000 were wheelchair users. 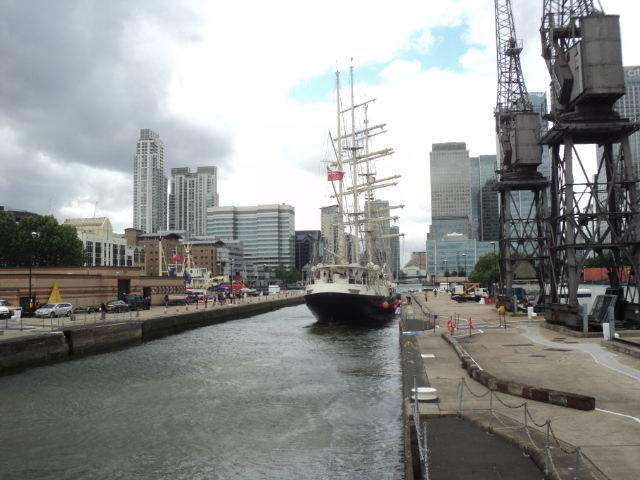 There is nothing better on a warm summers day than to take a walk next to the river, on the Isle of Dogs there are many areas where you can enjoy these walks. However to get access to the river on the “Island” in this way is a relatively recent phenomenon for up to the 1980s much of the riverfront was taken up by various industries and was not accessible to the general public. The ability to gain access to the river is the theme of the following humorous article written by Benny Green who was a well-known broadcaster, writer and Jazz musician in 1971. The first things I see are these: outside a shop in West India Dock Road the suits of sou’westers dancing on hangers like headless men celebrating their own whimsical condition; overhead the Limehouse sky punctured by cranes which took from a distance like the ship’s rigging that nobody will ever see again on London’s river; across the road the glum functional solidarity of ‘The Mariners Hotel,’ belying its name and telling you somehow that very little bridge ever goes across the water in these parts. Three contradictions almost before I have begun, so I wander off in search of at least one aspect of Dockland able to corroborate itself, and stumble on to a semi-detached out to be which on closer examination turns out to be advertising itself as the Public Baths, whether fraudulently or not I do not stay to see. By now I am altogether confused, and not helped by the presence all around me of a vague aroma compounded of fish, wood, rust, dry rot, damp, salt, tobacco, spice, seamen and poverty, an insidious perfume which keeps suggesting to me that now might be as good a time as any to find out once and for all, from the horse’s mouth, the difference, if any, between a binnacle and a spinnaker. The foreshore of London’s river is so cluttered, so obstructed by the processes of commerce, so masked by perspective that it is very nearly impossible actually to arrive at the water’s edge and trail your fingers in the muddy tide. At first it looks simple enough. A ship’s funnel behind the rooftops, a flight of gulls hovering, human voices amplified by the freakish acoustics of all large bodies of water, these are sure signs that the open sea cannot be very far away. But always there is a wall, or a warehouse, or a row of houses, between you and it. A man might walk for miles without finding a gap in the fortifications, although with luck and perseverance he might get his reward. The river glimpsed silver-grey from a side street, through the cavern of an empty warehouse, can still seem like a seascape suddenly rendered animate; or an incoming ship spotted from the top deck of a bus, reminding the eye that the Thames remains what J. B. Priestley once called it, London’s broadest street. And then there is the water itself, opaque with filth as it slops on to the foreshore, cutting its serpentine path around the Isle of Dogs, another romantic name, by the way, which has more or less nothing to do with the thing it is supposed to be describing. 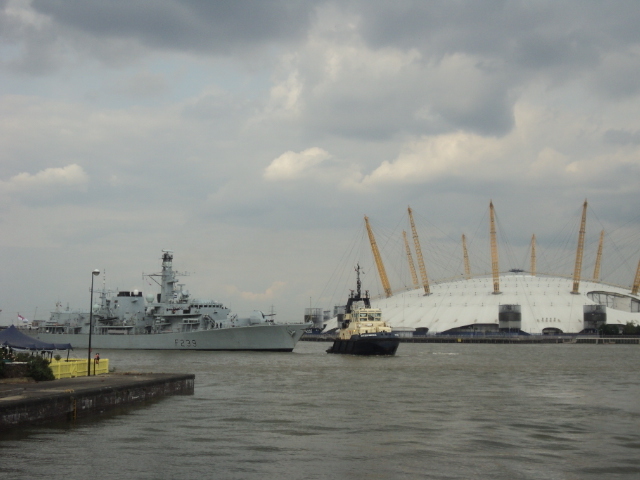 The Isle of Dogs is neither an island nor a dog sanctuary, but only a stark peninsula looped by the twisting lines of the river. There is only one main road in and out, and the explorer on wheels repeatedly finds himself brought up short by a notice saying ” Shipping supplied “; a corrugated iron fence whose forbidding aspect has to be seen to be believed. Overhead the gulls wheel in with their rumour of the river beyond, but on casual examination the back streets of the Isle of Dogs — there are no front streets — might be any back streets. 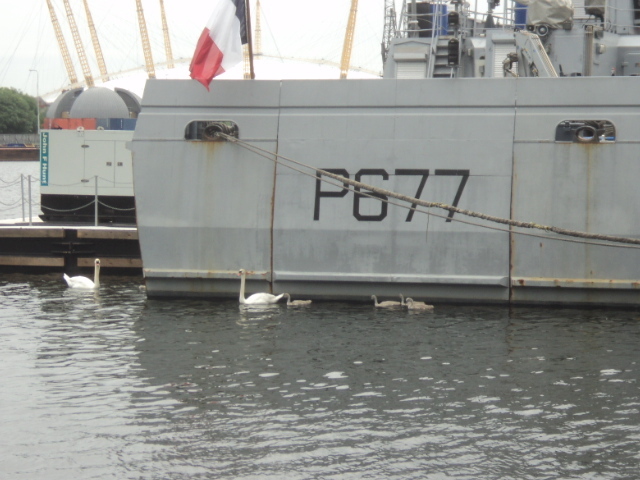 But then, like ghosts materialising, the signs of maritime life make themselves apparent to the naked eye. A fruiterer whose chromatic display of apples and oranges is overhung by a notice saying “Shipping supplied;” a plaque on the most improbable of all brick walls claiming that the ‘Great Eastern’ was launched here; the street names, Hesperus, Arethusa, Barque, Schooner, every one of them with grim facades mocking the poetry of their titles. 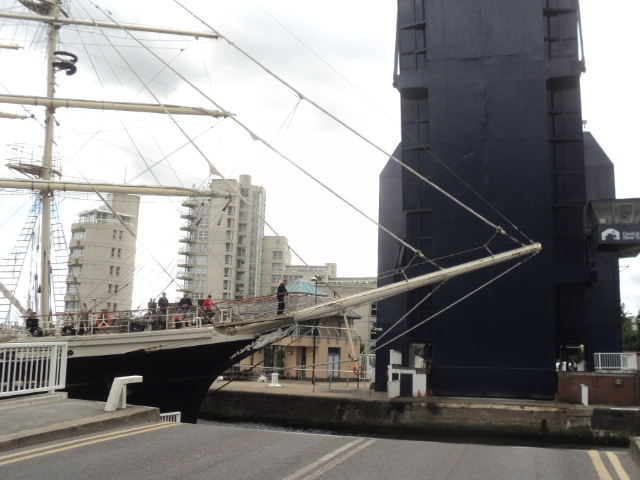 And occasionally the narrow space between wharves where a pedestrian can actually find the river’s edge. I found one such aperture, littered with the sad jetsam of river life, a rusting capstan, a seaboot, an anchor chain, a broken oar. And beyond this the river, grey under a fine afternoon rain, the gulls sitting complacently on its surface riding the tide, and on the far shore the fine lace filigree of the ‘ Cutty Sark’s’ rigging, tricked by the perspective into squatting in the lap of the eighteenth century, preserved in the lines of the Greenwich Maritime Museum. Though it is mid-afternoon, there is nobody in the streets, which makes me feel that tomorrow none of this will be here. 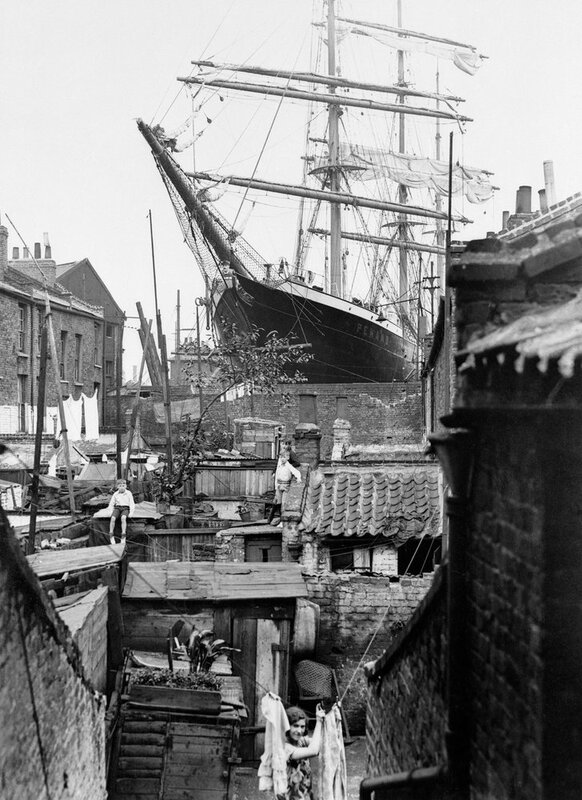 A narrow street, hemmed in by wharves, and underfoot a forgotten length of tramline intersecting the road at an angle. Perhaps tomorrow the houses will be removed to make way for a spectral tram to retrace its old route. Dockland Settlement, where they dispense Christian charity in what looks like the purlieus of hell. And then the, grimmest joke of all, Wapping High Street, surely the maddest named thoroughfare in all the world. There are no shops in Wapping High Street, no residents, no houses, only cavernous wharves and bonded warehouses, many with “To Let” signs dangling from their railings. The dim light in a first floor window suggests that at least one man is ticking off his bills of lading. 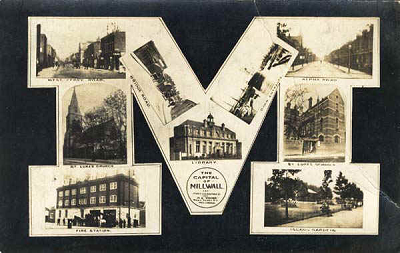 Otherwise there is no evidence that anyone has ventured up Wapping High Street this century. Rain falls on the pleasure gardens running down to the river’s edge. Today nobody seeks pleasure there. On the wall at Wapping New Stairs the notice tells you that bathing is dangerous. You are staggered that bathing should be allowed there at all, or that there is anyone anywhere who would want to indulge in it. And there, at the end of those cul-de-sacs that promise you the river and then cheat you at the last minute, there is a rusting tin door. On it, painted in erratic red paint, is the banner, ” Millwall FC forever.” How impressive the pedantic correctitude of that ” FC “. The work of some exultant supporter, perhaps, who drifted too far afield after a victory one Saturday night and could think of no better way to express his sense of triumph? At the Millwall ground they are said to throw the occasional milk bottle. If environment is any true guide to conduct, it is a source of wonder to me that they did not long ago tear up the goalposts, start a bonfire and broil the referee. 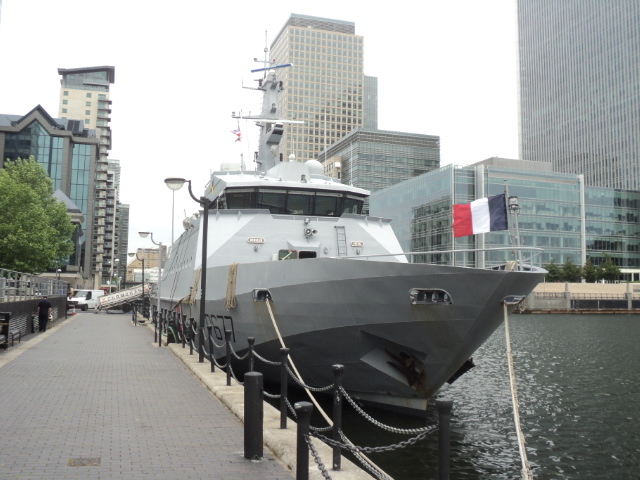 After the excitement of the visit of eight French ships a few days ago, we have a new French visitor in West India Dock. The F.S. 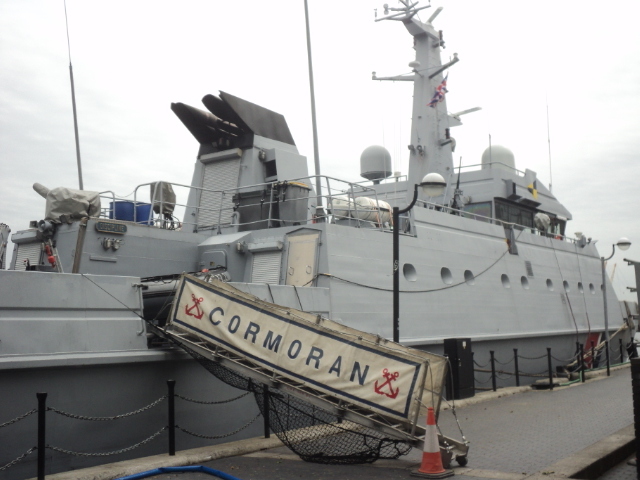 Cormoran is a Flamant class patrol vessel in the French Navy which is mainly used for fishery monitoring, search and rescue and patrolling French waters. 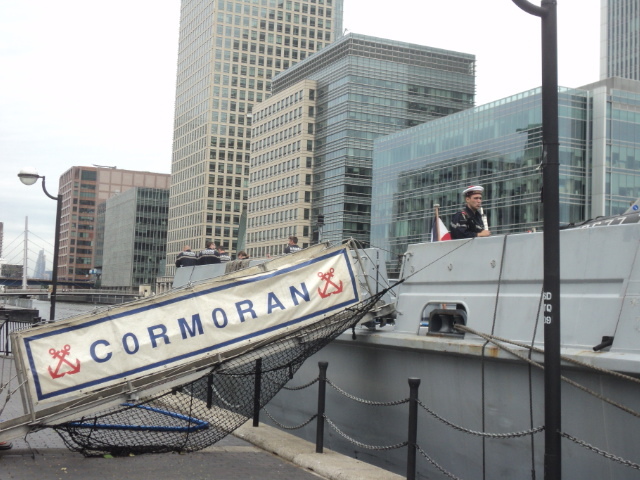 Usually based in Cherbourg the Cormoran was launched in 1997 and is on a three-day visit to West India Dock.